Martian conditions in miniature - In the Mars simulation chamber, DLR researchers recreated the atmospheric composition and pressure, the planet's surface, the temperature cycles and the solar radiation incident on the surface. The activity of polar and alpine lichen was investigated under these conditions. A series of experiments by DLR (German aerospace company) in Mars simulation chambers and on the ISS show that some Earth life (Lichens and strains of chroococcidiopsis, a green algae) can survive Mars surface conditions and photosynthesize and metabolize, slowly, in absence of any water at all. They could make use of the humidity of the Mars atmosphere. Though the absolute humidity is low, the relative humidity at night in winter reaches over 70% even in regions close to the equator, as measured directly in Gale Crater by Curiosity, because of the large day / night swings in atmospheric pressure and temperature. It may well reach much closer to 100% in regions where frosts are seen (including the Viking 2 lander site) and where ground hugging mists form, including equatorial regions in Valles Marineres and the Hellas basin. This is relevant to the search for native life on Mars. It is also relevant to planetary protection, the need to protect Mars from Earth life if we wish to study native life in the habitats in its original state. The Martian surface has high levels of UV, higher than found anywhere on Earth. Most lichens do not survive prolonged exposure to Mars surface conditions. However lichens at high altitudes and in polar regions need protection from high levels of UV too, if not quite as high as on Mars. The lichens studied in these experiments have special pigments to protect them, found only found in lichens, such as parietin. They also have protective antioxidants such as b-carotene. They are epilithic - grow on rock, and in our closet analogues to Mars conditions, for instance growing on rocks at high altitudes in Antarctica, they huddle in cracks with not much exposure to direct sunlight. It turns out that all this gives them enough protection to tolerate the light levels in conditions of partial shade in the simulation chambers and make use of the light to photosynthesize. UV protection pigments that help them to survive such conditions have been suggested as potential biomarkers to search for on Mars. An experiment simulating a Mars environment in a small chamber external to the ISS as part of Expose-E in 2008-2009 showed that one lichen, Xanthoria elegans, retained a viability of 71% for the algae (photobiont) and 84% for the fungus (mycobiont) after 18 months inn Mars surface simulation conditions. Moreover, those surviving cells returned to 99% photosynthetic capabilities on return to Earth. Another study in 2014 by German aerospace DLR in a Mars simulation chamber used the lichen Pleopsidium chlorophanum. This lives in the most Mars like environmental conditions on Earth, at up to 2000 meters in Antarctica. It is able to cope with high UV, low temperatures and dryness. It is mainly found in cracks, where just a small amount of scattered light reaches it. This is probably adaptive behaviour to protect it from UV light and desiccation. It remains metabolically active in temperatures down to -20 C, and can absorb small amounts of liquid water from the atmosphere in an environment where it is only surrounded by ice and snow. As measured in Antarctica, the relative humidity in the lichen's niche microhabitat varies from 57% to 79% as the temperature varies from -6 °C to -8 °C and externally it varies from 23% to 46% as the external temperature varies from 8 °C to - 8 °C. When exposed to full UV levels in a 34-day experiment in a Mars simulation chamber at DLR, the fungus component of the lichen Pleopsidium chlorophanum died, and it wasn't clear if the algae component was still photosynthesizing. However, when partially shaded from the UV light, as it is in its natural habitats in Antarctica, both fungus and algae survived, and the algae remained photosynthetically active throughout. Also new growth of the lichen was observed. Photosynthetic activity continued to increase for the duration of the experiment, showing that the lichen adapted to the Mars conditions. This is remarkable as the fungus is an aerobe, growing in an atmosphere with no appreciable amount of oxygen and 95% CO2. It seems that the algae provides it with enough oxygen to survive. 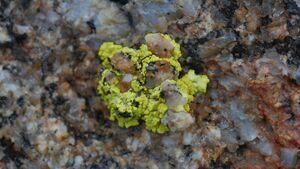 The lichen was grown in Sulfatic Mars Regolith Simulant - igneous rock with composition similar to Mars meteorites, consisting of gabbro and olivine, to which quartz and anhydrous iron oxide hematite (the only thermodynamically stable iron oxide under present day Mars conditions) were added. It also contains gypsum and geothite, and was crushed to simulate the martian regolith. This was an ice free environment. They found that photosynthetic activity was strongly correlated with the beginning and the end of the simulated Martian day. Those are times when atmospheric water vapour could condense on the soil and be absorbed by it, and could probably also form cold brines with the salts in the simulated Martian regolith. The pressure used for the experiment was 700 - 800 Pa, above the triple point of pure water at 600 Pa and consistent with the conditions measured by Curiosity in Gale crater. The experimenters concluded that it is likely that some lichens and cyanobacteria can adapt to Mars conditions, taking advantage of the night time humidity, and that it is possible that life from early Mars could have adapted to these conditions and still survive today in microniches on the surface. In another experiment, by Kristina Zakharova et al., two species of microcolonial fungi – Cryomyces antarcticus and Knufia perforans - and a species of black yeasts–Exophiala jeanselmei were found to adapt and recover metabolic activity during exposure to a simulated Mars environment for 7 days. They depended on the temporary saturation of the atmosphere with water vapour like the lichens. The fungi didn't show any signs of stress reactions (such as creating unusual new proteins). There Cryomyces antarcticus is an extremophile fungi, one of several from Antarctic dry deserts. Knufia perforans is a fungi from hot arid environments, and Exophiala jeanselmei is a black yeast endolith closely related to human pathogens. In this experiment, the temperature cycled between 21 °C and -50 and the relative humidity varied up to 70% at the lowest temperatures, with pressure 700 Pascals or about 0.69% of Earth sea level. The experimenters concluded that these black fungi can survive in a Mars environment. Note the higher latitude of Viking 2 which observed the seasonal frosts. Mists in Valles Marineres suggest high humidity there. Curiosity observed humidites of up to 70% in winter. In experimental studies of salt pillars in the Atacama desert, microbes are able to access liquid at extremely low relative humidities due to micropores in the salt structures. They do this through spontaneous capillary condensation, at relative humidities far lower than the deliquescence point of NaCl of 75%. These micro-organisms can survive because of numerous micro-pores in the salt, less than 0.1 micrometers in diameter in the salt. Theoretically, this reduces the limit for trapping water from the atmosphere down to relative humidities as low as 50-55% instead of the usual limit of 75%. Also once the water is trapped, it is retained for a long time, as the air gets even drier, right down to an extremely low relative humidity of 20%. 'The Atacama desert hosts the closest analogue of what a real, live Martian might be like', in its salt rock formations. The researchers, Wierzchos et al., did detailed studies with scanning electron microscopes. At 75% relative humidity then brine was abundant inside the salt pillars. As the humidity was reduced, even at 30% RH, the cyanobacteria aggregates shrunk due to water loss, but still there were small pockets of brine in the salt pillars. Endolithic communities inside halite pinnacles in the Atacama Desert take advantage of the moist conditions that are created by the halite substrate in the absence of rain, fog or dew. The tendency of the halite to condense and retain liquid water is enhanced by the presence of a nano-porous phase with a smooth surface skin, which covers large crystals and fills the larger pore spaces inside the pinnacles... Endolithic microbial communities were observed as intimately associated with this hypothetical nano-porous phase. While halite endoliths must still be adapted to stress conditions inside the pinnacles (i.e. low water activity due to high salinity), these observations show that hygroscopic salts such as halite become oasis for life in extremely dry environments, when all other survival strategies fail. Microbes also inhabit Gypsum deposits (CaSO4.2H2O), however Gypsum doesn't deliquesce. Researchers found that the regions of the desert that had microbial colonies within the gypsum correlated with regions with over 60% relative humidity for a significant part of the year. They also found that the microbes imbibed water whenever the humidity increased above 60% and gradually became desiccated when it was below that figure. The results presented here support the suggestion that evaporitic, chloride-bearing rocks revealed on Mars may represent a suitable habitat for life—in the past or even present—enabling photosynthetic activity and adaptation to a harsh UV and hyper-arid environment. This section is based on the survey article by Martinez et al, "The modern near-surface martian climate: A review of in-situ meteorological data from Viking to Curiosity." The humidity variations on Mars are mainly due to the daily and seasonal variations of temperature of the air. Colder air has a higher relative humidity for the same water content. The amount of water vapour can be measured as the volume mixing ratio of water vapour (VMR). This varies between around 10 ppm in winter and 70 ppm in summer at the Curiosity site. You might expect the highest relative humidity then to be in summer, but no, it's in winter, because it is so much colder then. The summer relative humidity is about 10% and the winter relative humidity around 70%. So, it's 10ppm (approx) for 70% RH in winter, and 70 ppm for 10% RH in summer (by a strange coincidence the numbers are reversed). Curiosity made these measurements of 70% humidity at a height of 1.6 meters above ground level (see Sect 14. This is in winter with a temperature range of around 50 C and mean temperature around -63 C, so highest temperature around -38 C and lowest temperature around -88 C (see their figure 5), and the highest humidity is normally reached between 04:00 and 06:00 Local Mean Solar Time (LMST). The lowest humidity readings are between 10:00 and 18:000 LMST, when they are typically less than 5%. The Viking landers didn't have humidity sensors. But the humidity can be estimated indirectly, with maximum volume mixing ratio of water vapour of 200 ppm for both spacecraft. The Viking 2 observed frosts for 250 sols of the year (frost usually suggests a high relative humidity close to 100%). Viking 1 and Curiosity didn't observe them directly. But there is indirect evidence that frosts may form at times at lower latitudes, including imaging of mists in the Valles Marineres, and possible observation of frost on the deck and calibration target of Opportunity. ↑ de Vera, Jean-Pierre (2012). "Lichens as survivors in space and on Mars". Fungal Ecology. 5 (4): 472–479. doi:10.1016/j.funeco.2012.01.008. ↑ R. de la Torre Noetzel, F.J. Sanchez Inigo, E. Rabbow, G. Horneck, J. P. de Vera, L.G. Sancho Survival of lichens to simulated Mars conditions Archived 2013-06-03 at the Wayback Machine. ↑ Sánchez, F.J. (2012). "The resistance of the lichen Circinaria gyrosa (nom. provis.) towards simulated Mars conditions—a model test for the survival capacity of an eukaryotic extremophile". Planetary and Space Science. 72 (1): 102–110. Bibcode:2012P&SS...72..102S. doi:10.1016/j.pss.2012.08.005. ↑ Billi, Daniela; Viaggiu, Emanuela; Cockell, Charles S.; Rabbow, Elke; Horneck, Gerda; Onofri, Silvano (2011). "Damage Escape and Repair in DriedChroococcidiopsisspp. from Hot and Cold Deserts Exposed to Simulated Space and Martian Conditions". Astrobiology. 11 (1): 65–73. Bibcode:2011AsBio..11...65B. doi:10.1089/ast.2009.0430. ISSN 1531-1074. PMID 21294638. ↑ 6.0 6.1 6.2 6.3 6.4 Martínez, G. M., C. N. Newman, A. De Vicente-Retortillo, E. Fischer, N. O. Renno, M. I. Richardson, A. G. Fairén et al. "The modern near-surface martian climate: A review of in-situ meteorological data from Viking to Curiosity." Space Science Reviews 212, no. 1-2 (2017): 295-338. ↑ "Solar radiation is the primary energy source for surface planetary life, so that pigments are fundamental components of any surface-dwelling organism. They may therefore have evolved in some form on Mars as they did on Earth." Wynn-Williams, D.D. ; Edwards, H.G.M. ; Newton, E.M.; Holder, J.M. (2002). "Pigmentation as a survival strategy for ancient and modern photosynthetic microbes under high ultraviolet stress on planetary surfaces". International Journal of Astrobiology. 1: 39. Bibcode:2002IJAsB...1...39W. doi:10.1017/S1473550402001039. ↑ Brandt, Annette; de Vera, Jean-Pierre; Onofri, Silvano; Ott, Sieglinde (2014). "Viability of the lichen Xanthoria elegans and its symbionts after 18 months of space exposure and simulated Mars conditions on the ISS" (PDF). International Journal of Astrobiology. 14 (3): 1–15. Bibcode:2015IJAsB..14..411B. doi:10.1017/S1473550414000214. ISSN 1473-5504. ↑ 9.0 9.1 9.2 9.3 9.4 9.5 9.6 de Vera, Jean-Pierre; Schulze-Makuch, Dirk; Khan, Afshin; Lorek, Andreas; Koncz, Alexander; Möhlmann, Diedrich; Spohn, Tilman (2014). "Adaptation of an Antarctic lichen to Martian niche conditions can occur within 34 days" (PDF). Planetary and Space Science. 98: 182–190. Bibcode:2014P&SS...98..182D. doi:10.1016/j.pss.2013.07.014. ISSN 0032-0633. ↑ Zakharova, Kristina; Marzban, Gorji; de Vera, Jean-Pierre; Lorek, Andreas; Sterflinger, Katja (2014). "Protein patterns of black fungi under simulated Mars-like conditions". Scientific Reports. 4: 5114. Bibcode:2014NatSR...4E5114Z. doi:10.1038/srep05114. ISSN 2045-2322. PMC 4037706  . PMID 24870977. The results achieved from our study led to the conclusion that black microcolonial fungi can survive in Mars environment. ↑ Bortman, Henry (Jul 25, 2011). "Islands of Life, Part V". Astrobiology Magazine (NASA). ↑ Davies, Paul (Aug 3, 2012). "The key to life on Mars may well be found in Chile". The Guardian. ↑ 13.0 13.1 Wierzchos, J.; Davila, A. F.; Sánchez-Almazo, I. M.; Hajnos, M.; Swieboda, R.; Ascaso, C. (2012). "Novel water source for endolithic life in the hyperarid core of the Atacama Desert" (PDF). Biogeosciences. 9 (6): 2275–2286. Bibcode:2012BGeo....9.2275W. doi:10.5194/bg-9-2275-2012. ISSN 1726-4189. ↑ 14.0 14.1 14.2 Wierzchos, J.; Cámara, B.; De Los Ríos, A.; Davila, A. F.; Sánchez Almazo, I. M.; Artieda, O.; Wierzchos, K.; Gómez-Silva, B.; Mckay, C.; Ascaso, C. (2011). "Microbial colonization of Ca-sulfate crusts in the hyperarid core of the Atacama Desert: implications for the search for life on Mars" (PDF). Geobiology. 9 (1): 44–60. doi:10.1111/j.1472-4669.2010.00254.x. ISSN 1472-4677. PMID 20726901. ↑ Vítek, Petr, H. G. M. Edwards, J. Jehlička, C. Ascaso, A. De los Ríos, S. Valea, S. E. Jorge-Villar, A. F. Davila, and J. Wierzchos. "Microbial colonization of halite from the hyper-arid Atacama Desert studied by Raman spectroscopy." Philosophical Transactions of the Royal Society of London A: Mathematical, Physical and Engineering Sciences 368, no. 1922 (2010): 3205-3221. This page was last edited on 25 March 2019, at 14:34.